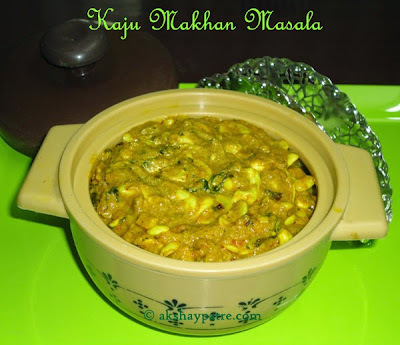 Kaju makhan masala recipe - Kaju makhan masala is a delicious creamy dish to relish with naan, roti, phulka, chapati, jeera rice and even steamed rice. Kaju Makhan masala is a North India's Punjabi speciality. It has rich gravy of cashews, onions, tomatoes, butter and fresh cream that is flavored with spice powder and the dish is different from the usual kaju curry. In fact, the thick gravy tastes better than the thin gravy, so while making this dish, keep the gravy consistency thick and you'll experience the creamy taste when this dish is taken into the mouth. I also make paneer and green peas makhan masala, mushroom and green peas makhan masala and mushroom and paneer makhan masala. In fact, kaju makhan masala is bit different than kaju masala. 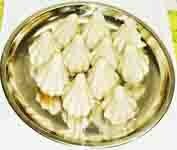 Kaju makhan masala is made by using butter and cream, whereas kaju masla doesn't contain cream or butter. Usually, for the makhan masala, kajus are shallow fried in butter, but I have just dry roasted the cashews as I don't like to add much butter or cream in our diet. Makhan in hindi means butter. Cashews are easily storable at room temperature in all season throughout the year. This kaju makhan masala can also be made on special occasions like birthday party, kitty party, potluck party, family get together and so on. Dry roast the broken cashews for 5 minutes and keep it aside. You can also shallow fry the cashews with butter. Don't roast the 15 whole cashews. Keep it aside to grind in the masala. Heat 2 tsp of oil in the same pan and add the onions, ginger, garlic, and green chillies. Suate till the onions become light brown. Add the tomatoes, stir to combine and cook covered till the tomatoes turn soft and mushy. Don't add water. The tomato needs to cook in its own juice. Once the tomatoes are soft, remove the lid and cool the mixture. Then combine together the 15 cashews and the tomato-onion mixture. Grind them to a smooth and thick paste adding little bit of water. Heat the butter and oil together in the pan. Add 1 bay leaf, the ground masala paste and saute till the oil oozes out. Then add the coriander powder, jeera powder, turmeric powder, chilly powder, garam masala and saute for 3 -4 minutes. Add little bit of water to make thick gravy. Add the salt and roasted cashews / kaju and bring it to boil on medium flame. Then add the kasuri methi and fresh cream. Boil it for 1 minute. Simmer till you get a thick consistency gravy. Add the chopped cilantro, mix well and serve the kaju makhan masala hot with naan, roti, phulka, chapati, jeera rice or steamed rice. Delicious and rich curry, looks yummy. Such an inviting masala...... Love to eat with plain paratha ! !